For you to get to that mental place you need the place to give you access or someone who knows or has 'access rights' to open that emotions-identity-motives door of yours and welcome you into the place in such a way that you would like to walk in around there. Once the doors are open to you, you perceive the place with your physical senses and may even be wowed by the place you have come to. You may even say something about the place depending on what you perceive. This means the place kind of engulfs you into itself so that you become a part and parcel of the place. So next time you repeat the words in the following verbalization you should create a visualisation, in your mind, of the atmosphere in the place where you are walking right now. Make sure, in your mind, that you convert the image you see into an atmospheric visual of your-emotions from your chosen image and then apply your senses to feel and embrace the good emotional atmosphere. 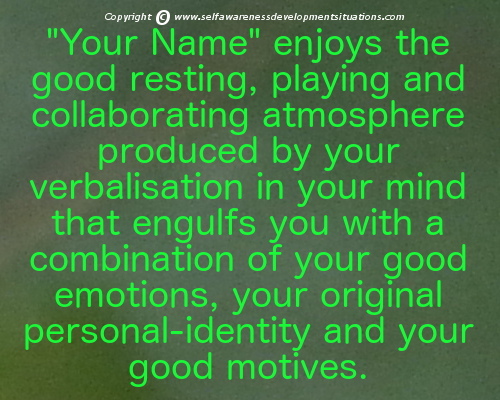 Make sure, in your mind, to add to your emotional atmosphere Your-Personal-Identity perceptions via your chosen picture and then apply your senses to try and pick up the enhancement of your emotional atmosphere with your personal identity atmospheric component. Make sure, in your mind, that all your above atmospheric role players are surrounded by your-motives atmosphere. When you find yourself inside this composite 3 dimensional atmosphere you are strengthening your emotions-identity-motives intelligence to handle your relevant situations. Make Real-time Consciousness of Your-EmotionsIdentityMotives-Atmosphere In Situations Your Awareness Priority!